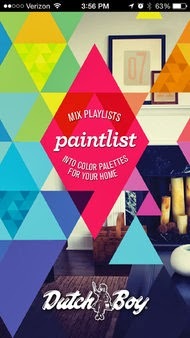 We love new sources of color inspiration at Colour Studio and this week we have a great addition to the list. It's not often you think of starting with music when deciding on paint colors for you home but now there is a new app that lets you do just that. 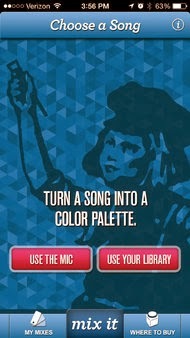 Paintlist from Dutch Boy paints is a free app for iPhone and Google Play which lets you choose any song to translate into a color palette. Similar to the well known music app Shazam, which identifies the title and artist for any song, Paintlist can also either listen to live music or select from your phones saved songs. Once the song is processed Paintlist creates three custom color palettes from it. The palettes are made to reflect the tempo, attitude and general feel of the songs. 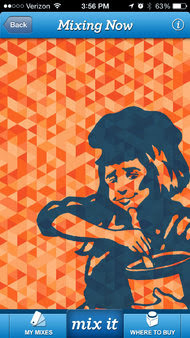 A danceable electronic tune, for example with a driving but not fast beat gave us the high warmth combination of Popcorn, Jazz and Convivial Red, while mixes for aggressive heavy metal, or pulsing reggae turned up individual palettes all their own. The app has its problems with its listening software being less than optimal, and the novelty factor wearing off after one or two uses but it does ask the question of what new ways you can inspire yourself when it comes to color. Take the camera out on your next hike and photograph trees clothed in ivy vines, observe the hues of fog grey or zoom in on a mossy patch of ground and bark. Listen to your favorite music letting it fill your head with pops of interesting color, slice visuals you love from magazines, take screen shots of websites, fashions and there is Pinterest and Tumblr for inspiration. Color is everywhere even in music, so we want to know how do you find yours?